The hydrologic (water) cycle, like other cycles, plays a direct role in the function of healthy ecosystems. The hydrologic cycle describes the movement of all the water on Earth. It has no starting point and involves the existence and movement of water on, in, and above the Earth. The Earth's water is always moving and changing states—from liquid to vapor to ice and back again. This cycle has been in operation for billions of years, and all life depends on its existence. 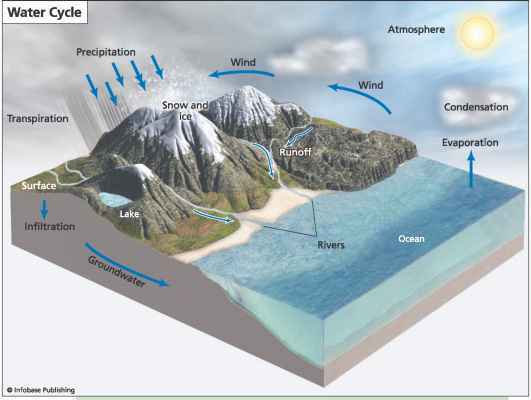 Many scientists are concerned because global warming affects major components of the water cycle in a negative way. When the cycle is in equilibrium, water is stored as a liquid in oceans, lakes, rivers, in the soil, and underground in spaces in the rocks (called aquifers). Frozen water is stored in glaciers, ice caps, and snow. It is also stored in the atmosphere as water vapor, droplets, and ice crystals in clouds. As noted previously, water can change states and move to different locations. For instance, water can move from the ocean to the atmosphere when it evaporates and turns from a liquid to a gas (vapor). Plants release water as a gas through transpiration. Water in the atmosphere condenses to form clouds, which can then form rain, snow, or hail and return to the Earth's surface. Water that comes back to Earth can be stored where it lands (in an ocean) or it can flow above-ground (river), or it can infiltrate the soil and move underground (as groundwater). Water continually cycles through the lithosphere, hydrosphere, biosphere, and atmosphere. Water evaporates into the atmosphere from the land and from the oceans and lakes. Plants and animals use and reuse water and release water vapor into the air. Water vapor in the air condenses to form clouds, which can turn to precipitation and fall back to the Earth. orating more water and holding more water (the warmer the air, the more water it can hold). This may have a twofold effect. First, in areas where more water vapor exists, more clouds will form, causing more rain and snow. In other areas, especially those far away from water sources, more evaporation and transpiration (together called evapotranspiration) could dry out the soil and vegetation. This means there would be fewer clouds and less precipitation, which could cause drought and cause huge problems for farmers, ranchers, cities, and wildlife habitat. All ecosystems in these areas would be negatively affected. In areas receiving increasing amounts of precipitation, such as portions of Japan, Russia, China, and Indonesia, more water will infiltrate the ground and over the surface. It could increase the levels of lakes and rivers, causing serious flooding and even forming new lakes. Wetter conditions will also affect the plants and animals in the area. Drier areas, such as Africa and the southwestern United States, will also experience serious effects. As the ground dries out from evapotranspiration, the atmosphere loses an important source of moisture. This, in turn, creates fewer clouds, which means there is less rain, making the area more arid. As less water is available to infiltrate the ground, less will be able to live off, on, or in the soil. Rivers and lakes would dry up, vegetation would die off, and the land would no longer be able to support humans, animals, and other life. How does carbon cycle from the hydrosphere to the atmosphere? 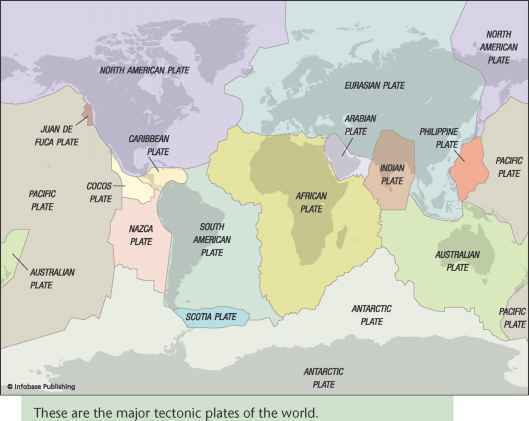 What are the lithosphere, hydrosphere and atmosphere? How the Earth cycles works? What name in the cycle releases water in the hydrological system? Why are there fewer clouds and less rain? What can affwct the water cycle in a negative way? How to draw the lithosphere? How the hydrological cycle is affected and can cause problems? How would the hydrological cycle be affected if the worlds ice caps melted?